We can make the quartz vanity top exactly according to your drawings. We have the professional manufactures to supply, not only natural granite and marble vanity top, but also Quartz stone vanity top. 1. Professional production: No matter what special shape or normal shape of the table top, we can professionally carry out holes, drill grooves, edge polishing and edge lamination. 2. Edge finishing: We can perform dozens of edge finishing according to customer's needs, such as bevel polishing, fillet, ogee, 4cm or 3cm laminated edge and so on. 3. Edge seamless: Our updated and professional seam and epoxy application treatment will make the laminated countertops seamless, pure white, black and so on. 4. Wide range of uses: Whether it is a kitchen, bathroom living room, bedroom and other residential areas, or commercial places such as hotel bank quarters, it is a display of applicability and stone properties. 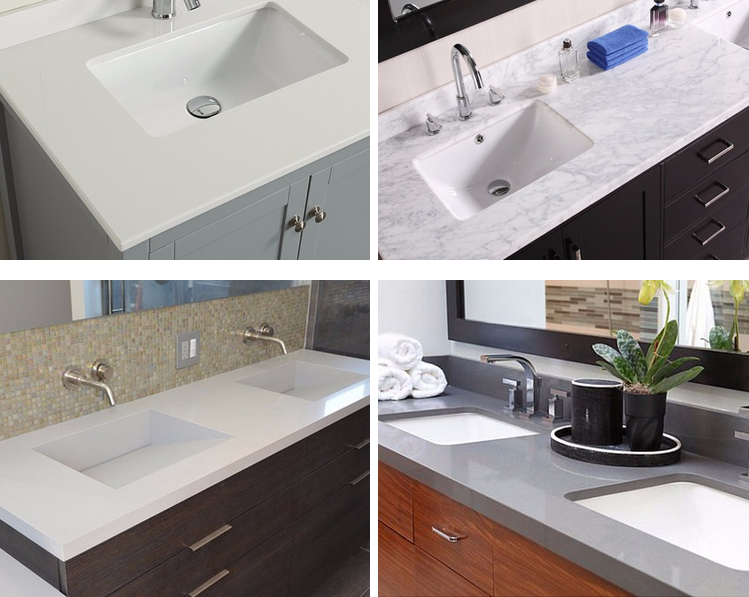 Edge: single bullnose, single square edge, double bullnose, double square edge, and mitered edge.